The stories of slavery and the civil rights movement can be found in countless history books and movies. And although many museums are rightfully dedicated to preserving the accomplishments and contributions of African Americans to civilization, there is only one committed to vividly reminding people of the horrors from this time in history. Unfortunately, many Americans feel that since the struggle of the 1960s and the reversal of many racist and oppressive practices, African Americans should have been able to “move on” by now. Perhaps it is easy for people to feel apathetic when they are so far removed from the victims and their stories. America’s Black Holocaust Museum brings the visitor closer to understanding the relationship between 500 years of slavery and the current state of race relations in our nation. The museum was founded in 1988 by Dr. James Cameron, the only known survivor of a lynching and a tireless fighter and leader for civil rights. After an inspiring trip to Israel in 1979, and after hearing of plans to create a Jewish Holocaust museum in Washington, D.C., Dr. Cameron decided he needed to preserve the history of lynching and the struggle of Black people for equality. He is author of A Time of Terror, an autobiographical account of the lynching he survived in 1930. In writing the book and founding the museum, he was determined to tell his personal story of survival and inspired to create a monument to share the painful story of those who suffered the crime and tragedy of the Black Holocaust. Through exhibits, speakers, and special events, the Museum offers opportunities for meaningful cultural and educational connection. Its mission is to “educate the public of the injustices suffered by people of African American Heritage and to provide visitors with an opportunity to rethink their assumptions about race and racism.” “Griots,” the museum’s tour guides, deliver oral presentations that provoke a soulful introspection into the lives of the victims of the Black Holocaust. In West African history, Griot (gree-oh) was the honored name bestowed on wise and knowledgeable storytellers entrusted with the essential task of documenting history. The interaction of the Griot and visitor fosters opportunity for dialogue and real discussion. (Dr. Cameron, one of the world’s most important Griots, turns 90 on February 25. He was not available to be interviewed for this article due to health reasons.) At the museum, history becomes tangible as the viewer is guided through a replica of a “cargo ship” that carried Africans packed in inhumane conditions to the new world. “One young lady actually fainted,” shared Reggie Jackson, a Griot for the museum. “This is nothing compared to what the Africans actually went through. We could never replicate it.” There is an auction block replica, and one can’t help envisioning themselves being inspected by potential masters. The experience is one of shock, discomfort, and reflection as visitors come face to face with images and vestiges from a painful past and are able to put into historical context the current-day consequences of the Black Holocaust. There are several exhibits on display at the museum (see sidebar). But there is no exhibit at this time depicting the brutal lynchings that were one of the most horrific acts committed against African Americans. The museum, like many nonprofit organizations, relies on the community’s continued support through visits, memberships, and donations, to bring in new exhibits and keep the founder’s legacy of truth and remembrance alive. “The museum is not just for Blacks. It is here for everyone to come in and learn how our past continues to impact all of our lives today…regardless of race. It is everyone’s history,” explains Caroline Carter, membership coordinator. Please contact her to learn how individuals, schools, businesses, and organizations can contribute and participate. The Middle Passage: A Voyage to Slavery A mural of an African Village and reproduction of the interior of a slave vessel depicting the African’s journey to the Americas. This permanent exhibit is housed in the museum’s main entrance. Through One City’s Eyes: Race relations in the Heartland This exhibit is in celebration of Black History month with a focus on Milwaukee and highlights African American leaders in Milwaukee. Dr. Martin Luther King, Jr. This exhibit depicts major events that occurred in the life of the civil rights leader. Cultural Landscape of the Plantation This exhibit presents photographs and architectural drawings from beyond the master’s residence: behind the big house, in a world dominated by African Americans who created their own sense of place, culture, and social history. African American Judges in Milwaukee This permanent exhibit depicts photos of African American judges in Wisconsin and their achievements. 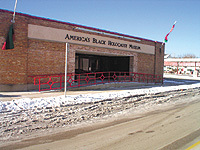 At A Glance: America’s Black Holocaust Museum 2233 North 4th Street Milwaukee, WI 414/264-2500 www.black holocaustmuseum. org Hours: Monday-Saturday, 9 a.m. to 5 p.m. Sundays by appointment for groups of 25 or more. The museum offers tours for schools, company’s, organizations, as well as individuals. 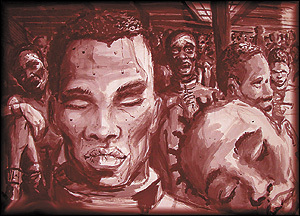 This painting, “Middle Passage” is by Eddie Davis. Davis’ work can be found all over Milwaukee, notably, the North Central YMCA and the Youth Leadership Academy. He is currently mentoring young artists at COA Youth and Family Centers. To visit his studio, call 414/374-8489.